Eighteen Indiana State University freshmen from across Indiana and Illinois received state-of-the-art laptop computers during a recent ceremony celebrating their arrival to campus and their participation in elite scholarship programs in the School of Business. NetWorks Scholars, Gongaware Scholars and President’s Scholars in the School of Business received the Dell computers as one of the perks of being among the elite group of students. "We wanted to do something special for the first class of NetWorks Scholars. We think the computers are an appropriate gift that the scholars will really be able to put to good use as they study and become more involved in the NetWorks program," said Bruce McLaren, associate dean, undergraduate programs. The NetWorks Scholars Program, funded by part of a $20 million grant from the Lilly Endowment Inc., provides chosen students with a $20,000 four-year scholarship. NetWorks Scholars are expected to participate in one paid internship, an international experience, work with faculty and executive mentors and participate in leadership development opportunities. Danielle Thompson, a freshman from Terre Haute, said the computers are a nice "extra" to the scholarship program. "With the new wireless system that’s in the School of Business, which is very state-of-the-art for us, I think it will help tremendously with our class work and all of the portfolios and assignments we have," she said. "It will be great for in the classroom too. We’re instantly connected to everybody in class." Nevin Ashley, a freshman from Bruceville, said the laptop computer presentation came just in time for him and his parents. "I didn’t know until about 15 minutes before we were going to go out and buy one that I was going to be getting a computer," Ashley said, adding that he is looking forward to the experiences he will gain by being a NetWorks Scholar. "The NetWorks Scholars program will prepare me in many different ways for a career after college," he said. "It’s going to help me in my leadership skills, my communication skills and all sorts of different attributes. I can put what I’ve been through - including internships and studying abroad - to the test in the real world. You can’t get anything better than hands-on experience. So once you go into your job, you’ll already be a couple steps ahead of everybody else." Daniel Quintero, a freshman from Seymour, agreed that being a NetWorks Scholar will help him achieve success in college so he can continue to be successful in his career. "I was pretty excited when I found out I was in the first class of NetWorks scholars," he said. It’s an elite group. ISU is trying to build future leaders … and they’re including me in that group. Being chosen made me feel special." Ronald F. Green, dean of the School of Business, congratulated the scholars and wished them success in their first academic year. "I am pleased to finally have the first class of NetWorks Scholars on campus and attending classes," Green said. "They are part of a very special group of students who will provide leadership to campus, the financial services industry and other parts of corporate America. It is exciting to think of their potential and I look forward to working with them throughout their years at Indiana State." April Huey of Oblong, Ill.
Mallory Lopeman of St. Charles, Ill.
Dustin Newlin of West York, Ill.
Ashley Cribelar of Martinsville, Ill.
Read the newspaper or turn on the news on any given day and there are bound to be stories about spiraling credit card debt, all-time high personal bankruptcies and record high foreclosures in Indiana and the nation. 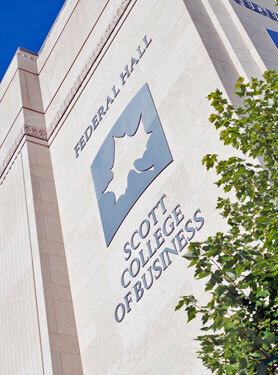 A group of educators and business people met March 21 at Indiana State University to begin finding solutions to Americans' financial problems. The answer, many of them agree, is in the nation’s youth. "An overwhelming 68.1 percent of those surveyed learned to manage money at home," said David Bixler, president of the Indiana JumpStart Coalition, about a Personal Financial Literacy Survey administered to a national sampling of 4,024 high school seniors. "If mom and dad can’t make good financial decisions, how can they teach their kids?" Bixler was among the guests at the NetWorks Personal Financial Literacy Initiative Curriculum Summit conducted on the third floor of Hulman Memorial Student Union. The purpose of the meeting was to bring important stakeholder groups to the table to discuss the current situation of personal financial literacy in Indiana; to identify the personal finance skills and competencies; and to assess the gaps in the educational processes. This is the first step in the ISU NetWorks Personal Financial Literacy Initiative and will be followed by other steps designated to improve the state of personal financial literacy in Indiana and, eventually, the nation. Other guests included: Barbara Beadle, business and marketing education state supervisor, Indiana Department of Education; Tim Schilling, Federal Reserve Bank of Chicago; Gary Bolinger, Indiana CPA Society, president and CEO; Mike Webster, vice president and manager, installment loan department, Terre Haute First National Bank; Lisa Webster, assistant vice president and loan officer, Terre Haute Savings Bank; and several other members of the state’s K-12 educators and business professionals. Bill Wilhelm, assistant professor of administrative systems and business education and organizer of the summit, said eventually, he would like to see personal finance taught in K-12 classes not as an elective, but as a core class. "This meeting today will serve as a cornerstone to build a comprehensive list of the skills all people should possess upon high school graduation when it comes to personal finance," Wilhelm said. "What basic skills do they need to survive?" Jennifer Petersen, an ISU alumna who teaches accounting and personal computer applications at Ben Davis High School in Indianapolis, said the meeting and the initiative are great ideas. Many of her students don’t realize how much things cost or what goes into creating a budget. "I have my students do a budget project in class and many of them have no clue how much things cost or how much their parents spend on them," Petersen said. "It’s really an eye-opener for them. I tell them, 'I don’t care who you are. You could become the next Bill Gates and have your own accountants keeping track of your money. But wouldn’t it be nice if you could look at your money and be sure no one was ripping you off?'" Ron Green, dean of the ISU School of Business, said NetWorks has a broad vision of how it can help shape the future of the financial services industry in Indiana, the nation and the world. "It's gratifying to bring people together from different disciplines to discuss the needs for personal financial planning," Green said. "We want to make sure we have the appropriate awareness of the need for education in personal finances in the school system." After the March 21 meeting, Wilhelm plans to conduct three rounds of online surveys where participants will rank and rate data in terms of importance. From there, he will look at how the results compliment the work already done by the JumpStart Coalition and what the next plan of action should be. ISU received a $20 million grant from Lilly Endowment Inc., in October 2002. The financial literacy summit was the first of a series of upcoming programs and initiatives that will be made possible with this grant. NetWorks is an outreach of the ISU School of Business to provide new directions in financial services for Indiana, the nation and the world.